Community service is a core value, personally and professionally, of the Bellmark team. This commitment starts with Bellmark founder, Stuart Heath, who has served as a volunteer in the U.S. and in many developing nations around the world to make a difference in the lives of others. He believes the shared value of service strengthens Bellmark as a small company and employer. The main thrust of Bellmark’s community service work is working with Habitat for Humanity International (HFHI) Global Village program to build homes in developing countries. 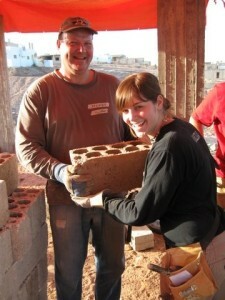 Stuart has participated in and led Global Village home-building teams in Jamaica, Hungary, Chile, Dominican Republic, Jordan, Brazil, Guatemala, Romania, Portugal, and Cambodia. As part of the commitment to Habitat for Humanity, Stuart established the Bellmark Community Service Scholarship in 2007 to combine his commitment to community service, his work in education for young people, and his passion for international travel. The scholarship is designed to cultivate community service leadership in promising young adults through education and hands-on experience while supporting Habitat for Humanity International. Every one to two years, a scholarship recipient joins Stuart on an HFHI Global Village trip to build homes in a developing country. Stuart has served in court rooms, board rooms, and beyond as a hands-on volunteer, Board member, pro bono attorney, and more. One of his earliest contributions of service was working in Mother Teresa’s Kalighat Home, a free hospice for the poor, and Prem Dan, a home for the destitute and elderly in Kolkata (then named Calcutta), India. He literally walks the walk as Chair of the City of Bellevue Parks and Community Services Board: he has visited almost all the city’s nearly 100 parks. Read about his park exploration in Bellevue’s It’s Your City.